It's Nutrition Month! Take a 100 Meal Journey. Happy Nutrition Month! Yes, March is Nutrition Month. Nutrition Month was created many years ago by Dietitians of Canada to encourage Canadians to eat more healthfully. While it’s easy to get cynical about it because nutrition month been co-opted by all sorts of dubious food companies and self-defined nutrition experts, I choose to stay optimistic. Nutrition Month is a great time to be inspired to make changes to eat more healthfully. 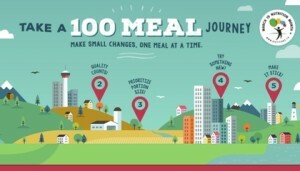 This year’s theme is “Take a 100 Meal Journey”. It’s about the fact that big, sweeping changes don’t stick. Instead, focus on making a small, lasting change and stick with it... one meal at a time. Commit to your small change for each meal over 1 month (i.e. 100 meals). Yes, I know that we’re almost at the end of March so it may seem strange that I’m reaching out to you today. But Spring came on the weekend. It’s the time of year that many people think of spring cleaning their eating habits. Instead of cleansing or going on a detox (which can’t really undo a lifetime of unhealthy eating habits), I’m encouraging you to make 1 small lifetime-long change. Turn off the screen when eating (eat mindfully). Fill your plate with 1 more serving of vegetables. Choose real whole grain instead of white bread (or brown rice instead of white). Drink enough water. Keep a reusable water bottle on your desk and in your car so it’s ready for sipping. Put a bowl of fruit on the kitchen counter. Keep all other food in the fridge or cupboards. Snack healthier. Store nourishing snacks, like cut up veggies, handy at eye level in your fridge. Put tempting treats at the back of the cupboard. Keep nourishing snacks, like fruit and nuts, pre-portioned in small packages for grab ’n’ go snacking. Put a bowl of apples by the front door so you can grab a healthy snack on the way out. Keep snacks off your workspace if you find you eat them even when you’re not hungry. Does the 1-Bite Rule Work?